There are many solutions available when you have a missing tooth or teeth. Between dentures, partials and bridges, you have a lot of options to choose from when you’re looking for the right treatment for a missing tooth or missing teeth. However, in terms of the quality of life, none can compare to dental implants. 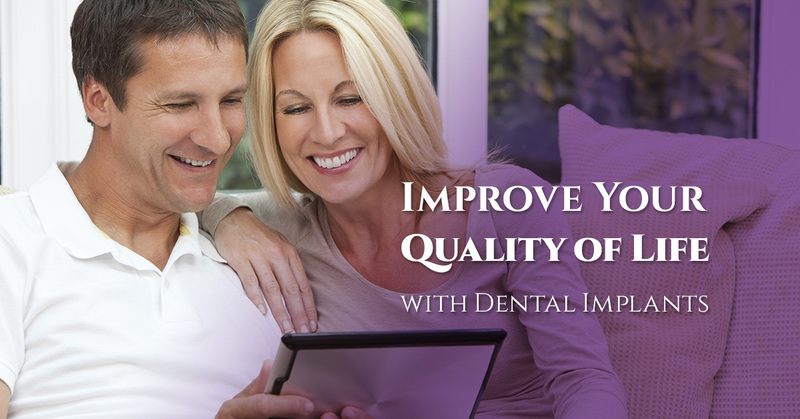 But, how exactly can dental implants improve your quality of life? #1. They restore optimal function. When it comes to functionality, no other treatment option for missing teeth can provide the kind of results you’ll get with dental implants. Getting dental implants is the next best thing to keeping your natural teeth because they make it possible to chew and speak as you normally would. #2. They help to prevent future bone loss. The jawbone relies on stimulation from the teeth in order to stay strong, and when a tooth isn’t there to put pressure on the jaw and stimulate it, it will actually start to deteriorate. Bone loss is a serious problem for people missing teeth, and it’s the main reason why it’s essential to get treatment right away. Dental implants are the only treatment option that stimulates the jaw the way your natural teeth do, which means that they are the only option that helps to prevent future bone loss. #3. They help you smile confidently once again. 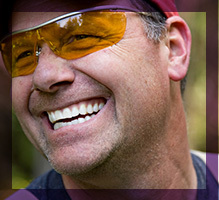 Missing teeth can affect your appearance like no other dental problem. And, one of the best ways to restore the natural beauty of your smile is with dental implants. With dental implants, you don’t have to worry about dentures sliding around or the metal from bridges showing. #4. They help to protect the surrounding teeth. When you get a bridge, it is anchored to the surrounding teeth, which have to be trimmed down and topped with crowns. With a dental implant, there’s no need to unnecessarily damage any perfectly healthy teeth, as the implant will be anchored right into the jaw. In general, dentures will last around five years, and dental crowns can last for around 15 years. Dental implants, on the other hand, could potentially last a lifetime. If you are looking for long-lasting results, then dental implants are ideal for you. As long as the dental implant is placed properly, and you take proper care of it, it can last a lifetime. Find out if dental implants are the right option for you. As you can see, dental implants can improve your quality of life in many different ways. Whether you are interested in dental implants to regain the optimal functionality of your teeth, to regain confidence when you smile or because they last for such a long time, it’s important to find the right dentist for the procedure. Placing dental implants properly requires careful and thorough analysis and planning, as well as a coordinated effort between the dentist and any other specialists involved. In Lawrence, there’s no better dentist to turn to for dental implants than James Otten Dentistry. Schedule your appointment today to find out if dental implants are the right option for you.